I’m in for some surprising construction, this one is really my thing. It’s kind a’ fun to start a cardigan with only 9 stitches. 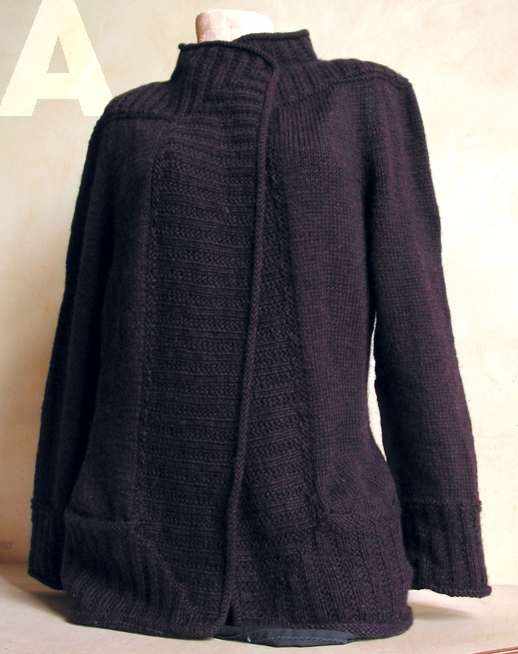 Amandine is an open, drapey cardigan with a very, very unusual construction and ¾ or long sleeves. It can easily be closed with a shawl pin. It is worked seamlessly, in the round from the shoulders downwards and sideways with invisibly worked sleeve insets. I called it amandine, because it’s basic shape looks like an almond (amande in french). A long time I didn’t post anything on here. I’m working on several projects. So soon you will hear from me again. All shaping is done in the center part. Broken rib bands are worked all around, shaping the shoulder line and hiding 2 pockets. The yarn I used is Cascade Heathers in a lovely color: chocolate brown, prune, nearly black.